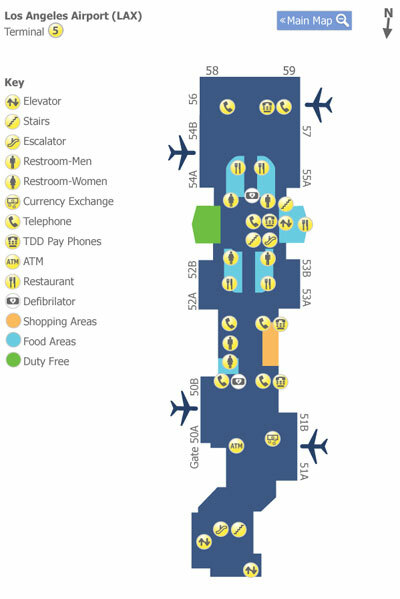 GUIDE: LAX / Los Angeles International Airport - MCT, Connection, etc. Please edit or add information to this wiki as necessary. 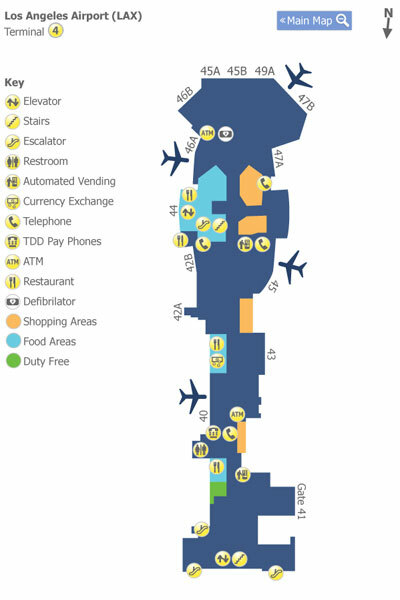 NOTE: AA uses Terminals 4 and 5, the remote “Eagle’s Nest” and some gates at TBIT . International Arrivals in particular may use T4, TBIT (100s numbered gates), the remote arrival piers (200s) or the maintenance hangars (300s); in the latter cases, passengers will be bussed to T4 (domestic and some international) or TBIT (some international), as both have USCBP processing facilities. NOTE: LAX is always undergoing changes; be aware the information herein may change. See here for LAWA notices affecting passengers. Link LAWA / LAX FAQ page. NOTE: The Admirals Club® lounge and Flagship Lounge in Terminal 4 at Los Angeles International (LAX) have been renovated and include Flagship Dining for those in eligible three class First cabin. NOTE: the 100s gates are at the Tom Bradley International Air Terminal (aka Terminal B), accessible to / from Terminal 4 by the airside connector if you are already airside and security cleared. The 200 gates are the remote piers served by bus, and the 300 “gates” are the maintenance hangars served by bus. At least 60 minutes before scheduled departure, for flights to or from airports outside of the United States. Some non-US require more. If you are checking in with baggage to check at T-4, not T-5, and flying American Eagle from the remote "Eagle's Nest" 52A-J gates (31 Jan 2017 and after), you must check in 90 minutes prior to departure. LAYOUT: LAX is like a letter "U" on its side, open end facing right. The Tom Bradley International Terminal is the bar of the "U" facing left, on the west side. Terminals 1, 2 and 3 on the north and 4 - 8 on the south. Entering the semicircular, counter-clockwise roadway serving the terminals, you will pass terminals 1, 2, 3, TBIT, 4, 5, 6, etc. There is quite a bit of construction going on and the airport roadways can get quite congested. MCT: Though international to International or Domestic Minimum Connect Times (MCT) are listed as 2:00, arriving at the remote western 200 pads and gates (served by busses from the terminals), connecting between T4, T6, Remote Eagle terminal and TBIT, not to mention lengthy USCBP queues and the need to proceed landslide to connecting terminals and processing security may make 2:00 unrealistic at times. MCT Domestic to Domestic or International is often 0:40, but this may be unrealistic if connecting American Eagle remote terminal 52A-J and a domestic flight at TBIT, for example. Terminal 4: AA primarily uses Terminal 4, Gates 40-49 but now also uses Terminal 5 (50-59, 52A-I remote Eagle gates and TBIT (110-159). Flagship Checkin, Admirals Club and Flagship Lounge are all in T-4. Tom Bradley International Terminal ("100") gates 110-159 for domestic and international flights, with no particular flight assignment - check your gates information. oneworld Business and Qantas First lounges in TBIT for qualified passengers. See LOUNGE DASHBOARD for further information - link. Occasionally, the "200 gates" remote pads (bus from T-4) may be used. Terminal 4 and TBIT are connected airside by a new connector. Qualified travelers may use the TBIT oneworld Business or Qantas First lounges. See separate thread. Terminal 5 AS OF Tue 31 Jan 2017: Legacy US flights operate from Terminal 5, gates 50 - 59. It is best to check in for American Eagle flights at T-5. Airside connection exists, as well as shuttles. Bus port at T-5 is at gate 52. American Eagle checked baggage is delivered to Terminal 5 baggage carousels; Eagle remote gates are now numbered 52A-J. Terminal 6: Alaska Airlines flights operate from Terminal 6. Legacy US flights operated from Terminal 6 until 31 Jan 2017; AA no longer operates out of Terminal 6. American Eagle Remote Terminal "Eagle's Nest": Regional flights operate at a remote terminal served frequently by airside shuttle busses from bus gates 44 and 60. The remote American Eagle terminal gate numeration has changed: "May 16 2016 the remote gates at LAX formerly 44 A-J were renumbered to 60 A-J." There is a "junior" Admirals Club here. Preferred Eagle check in and baggage carousels are in T-5? While you may check in at T-4 for American Eagle, those with baggage to check must do so no less than 90 minutes prior to departure. The preferred baggage check deadline is in place at T-5 for American Eagle. Note: You can walk airside between Terminal 4 and TBIT as of 25 Feb 2016. See LAX Terminal 4 - Tom Bradley Intl Terminal Secure Connector), and on to T-5 via a corridor (ground floor, by bus gate 44). Terminals on the south side and TBIT are connected airside. A PDF guide is downloadable here. One can also walk landside between terminals on upper or lower walkway sidewalks just outside the roadway. Lower walkways are protected from the weather, upper walkways are not. Distances can be short (T-4 <-> TBIT) or long (20 minutes or less in all cases, and there are crosswalks and walkways serving north and south terminals. See north - south blue corridors in Ground Transport map, above; walkways parallel them. For access to the Tom Bradley International Terminal ("TBIT") one may also proceed landslide and walk a short distance, or take the counter clockwise landside courtesy airport shuttle bus. Here is a graphic I made from a Google Earth Streetview screenshot that shows how close T4 is to TBIT. It's a two-minute walk. One minute if you are fast. Terminals 4 and 5: A courtesy shuttle bus operates airside between Terminal 4, ex-gate 44 bus gate, and Terminal 6 gate 60-62 through Mon 30 Jan 2017 - afterwards, Terminal gate 52, every fifteen minutes between 05:00 and 23:00; ongoing boarding pass required. At other times one either take the airside corridor T-5 Tue 31 Jan and after <-> T-4 or exit landslide and walk or take the counter-clockwise landslide courtesy shuttle bus. American Eagle Remote Terminal: A courtesy shuttle bus serves the American Eagle remote terminal from Terminal 5, gate 52. Note: American Eagle checked baggage is delivered to Terminal 5 baggage carousels. Another shuttle runs from Terminal 4, gate 44 bus gate. A boarding pass to Gate 52A-I is required. This is the sole way of reaching these gates (other than Five Star Service passengers, who are shuttled via the Tarmac in Cadillac SUVs). Terminal 4 - TBIT: The new pedestrian airside connector opened 25 Feb 2015. Qantas and AA passengers departing the TBIT can check in at Terminal 4, process airside, use Admirals or Flagship lounges T-4 <-> TBIT shuttles apparently ended when the airside connector open 25 Feb 2016[/hl]. Walk Terminals 4 and 5: One can walk airside using the Terminal 4 - 5 - 6 connector. Walk Terminal 4 - TBIT airside connector: An airside connector leading to TBIT is open effective 25 Feb 2016. See here (FT) for more. "C" line buses: Transports passengers to and from Parking Lot C. Travelers can walk to the LAX City Bus Center from Lot C. "C" route operates 24 hours a day, 7 days a week, and runs every 10 to 15 minutes. "G" line busses: Transports passengers with a valid TAP card to and from the Metro Green Line Aviation Station. Service is aligned with the rail schedule. To view, please go to www.metro.net . Click here for Green line Boarding Procedures (PDF document). TAP card is not required when taking the G Bus from LAX to the Aviation Metro Station. Use this link for a real time map display of shuttle bus locations and movements. Rental car company busses: transport passengers between terminals and car rental facilities. NOTE: Rental, hotel shuttle, Über, etc. stops are in front of each terminal on the arrivals / lower level at the island crossing the first lanes of traffic. Link to FlyerGuide information on LAX T-4 Security. Priority Access line in a Terminal 4 is accessed from the escalator on the left end (looking at the counters) of the terminal (furthest from TBIT, closest to terminal 5), next to the Priority Access check-in area. Often there is an AA worker at the bottom of the escalator making sure only Priority Access passengers go up this escalator. The First, Business and Priority Access lines now have their own screening room far from the economy area. This private room has multiple screening lines and during peak periods additional lines are opened up. Security for (TBIT) international arrivals proceeding to Terminal 4 is open as of February 2017. When exiting TBIT customs and baggage recheck area, turn right immediately after the exit and proceed down the hallway to the checkpoint. No Pre-Check. Flagship Check-in: YES Marked exclusive T-4 Flagship check-in entrance 4:00 a.m. – 1:00 a.m.
Curbside check-in: Yes. Terminal 4 only, including for international destinations. To help us get your bag on the same flight with you, present your bag to an airline representative for check-in no later than the cutoff time. Time to baggage delivery: expect 0:30 or more. Terminal 4: upon entry, Qantas to right; First and Priority Access to left; Main Cabin straight ahead. If departing on American Eagle, suggested check-in at T-5 Tue 31 Jan 2017 or after. Q. What are minimum check-in time requirements at LAX? AA requires arriving a minimum of 45 minutes prior to domestic departures if departing domestically (including Hawai'i, Puerto Rico and the U. S. Virgin Islands) if one has no baggage to check; 60 minutes if one must check baggage; and two hours prior to international departures. Additionally, AA requires passengers be checked in at least 45 minutes prior to scheduled departure at LAX and "Arrive at the gate and be ready to board at least 15 minutes prior to domestic departure" and 30 minutes prior to international departure. Gates close to boarding 10 minutes prior to departure. Q. What is the domestic to domestic or domestic to international Minimum Connection Time (MCT)? The minimum connect time at LAX, domestic to domestic or international, is 0:40 minutes. International to domestic or international MCT is 2:00, but as mentioned previously, this may be insufficient. Note: MCT is generally not waived for international passengers arriving from USCBP pre-clearance airports. See AA domestic to international MCT from ExpertFlyer Nov 2016 c/o Serfty here. Q. If I am making an international to international connection, what is the process? There is no international transit process in nearly all airports in the USA (DFW and MIA have a baggage exception for international to international). Arriving internationally, unless you have been pre-cleared, you must proceed through U. S. immigration (there are kiosks and a fast channel for Global Entry approved passengers), recover your baggage from the baggage carousel and proceed through U. S. Customs. Upon exiting Customs at TBIT there is a bag drop facility; drop your checked baggage, exit to the landside arrivals area. Pre-cleared passengers arriving at TBIT will bypass USCBP (but most airlines will enforce international to domestic MCT nonetheless). ALL arrivals are forced landside (you may pass back through security at the TBIT end of the T-4 - TBIT connector) and Terminal 4 is a short walk to your right, Terminal 6 farther; one can board courtesy airport "A" busses and be dropped off very shortly at T-4 or T-5. NOTE: Whilst most international Arrivals process immigration and customs at TBIT, some arriving at T-4 may walk a long underground passage and process formalities at TBIT. Others may process at T-4, but if you arrive with bags those will be available at TBIT. There is no Arrivals Loinge for AA or oneworld customers at LAX. Q. What is AA policy if I have separate tickets and my incoming flight is delayed? Your oneworld connection is generally not officially protected, but the airline may help you and put you on the next available flight, and AA does generally protect oneworld connections at this time.. Connecting between airlines at unfamiliar airports can be a stressful experience, especially if your flight is delayed. American Airlines recognizes the impact delays and missed connections can have on your plans and on your life. That is why we partnered with the other oneworld member airlines to form teams of connection experts: oneworld Global Support. At select airports across the oneworld alliance network, teams are proactively monitoring connecting flights and, whenever possible, they will meet and assist you if your connection is in jeopardy. The oneworld Global Support teams will do their best to allow you to use dedicated fast track lanes through immigration or security to help you catch your next flight. Our teams will also do everything possible to transfer your baggage so that it makes it on time to your final destination. oneworld Global Support is currently available at Chicago O'Hare, Dallas/Fort Worth, London Heathrow, Los Angeles, Madrid-Barajas, Miami, New York JFK and Sydney. The service is offered at these airports whenever possible, subject to operational constraints. Q. Can I check my baggage through? If you're connecting within the oneworld alliance or airlines with an interline agreement and your connection is under eleven hours, all segments on the same PNR, probably. If over that or with separate PNRs (even within oneworld) airlines without an interline agreements with AA or on separate tickets connecting with non-oneworld airlines, no. See oneworld not requiring protection or interline baggage 1 Jun 2016; AA policy. Q. Is there baggage storage at LAX? No. Since 9/11 most USA airports have eliminated baggage storage, but you can use a baggage storage firm that will pick up, store and return your baggage. You do not have to pre-book, and they are open 24/7: http://www.laxluggagestorage.com. There are $5 pickup, $5 return and storage charges. "Internet Access at Los Angeles LAX Airport. LAX Airport offers free internet access, with paid upgrades: Free Wi-Fi service for up to 44 minutes is available in most of the public areas of the Airport - provided by Advanced Wireless Group." Link to AA FAQ: Will I make my connection? Posts from 2015-2017 have been archived to ARCHIVE: 2015-2017 GUIDE: LAX / Los Angeles Int’l. Airport - MCT, Connection, etc. Remote gate arrival is bused to TBIT. There is no sterile bus gates at T4, only secured bus gates (to/from Eagles Nest). Also there is no walkway from TBIT immigration to T4. It is an one-way only passage from T4 to TBIT immigration. If you try to go the other way, TSA will stop you. Your information is quite out of date - remote gate arrivals are (at least sometimes) bussed to TBIT for a walk to customs and immigration at T4 (using the same walkway that used to be used to get people from T4 to TBIT baggage claim). In fact if you try to get off the bus and go into TBIT, the security folks will not let you through. I don't know how all the different configurations work, but having arrived on LHR-LAX twice now at remote gates, I know that those flights went through T4 customs and immigration via buses to TBIT first. Does the flight connections security check point at TBIT have TSA precheck lanes? I will definitely have to use that check point on my LHR-LAX-SAN routing, but was wondering if I could used that on the LAX-LHR outbound if things on the departure level are a bit busy. LHR-LAX generally arrives at T4, or at remote gates - and I'm pretty certain you'll go through Customs and Immigration at T4 and then you would use the TSA-Pre lane in T4, rather than walking back to TBIT. Last time I arrived at TBIT (before T4 had all the facilities - about 6 months ago) the TBIT security lanes only had pre-check-Lite, but since they also never have anyone waiting, it is still quite quick. However, I've never found the T4 pre-check line to be anything other than quick too (but maybe I'm just lucky). sorry, should have mentioned that I’ll be on BA metal for the LHR-LAX route as I wanted to avail myself of the CCR at LHR on the way home, so I’ll be clearing immigration and customs at TBIT. I also hope to have time to stick my head in the door of the QA F lounge at TBIT between flights, hence preferring to go through TSA at TBIT before decanting myself to the eagles nest for the final puddle jump home. Just to verify because I want to be there the second she comes out :-), picking up daughter, coming in to Gate 43 today from LHR, has GE and one gate-checked bag (darn BA at EDI). She will come out on the lower level at T4 on the side nearest TBIT? That has been my experience arriving international at T4, yes. Thanks, we just arrived there less than a month ago out of NRT, but we had no bags and dumped out there and my memory was hazy about them having possibly pointed us a different way with no bags. AA109 yes... it usually will arrive during the time T4 immigration is open. AA135 maybe... it sometimes arrive after T4 immigration is closed. The last 2 times I took 135, I ended up walking to TBIT immigration. Currently projected to arrive at 4:39 so fingers crossed. Same parking either way I guess. For future reference AA135 did indeed come out at T4 international arrivals. Her bag did not, it seems to have decided to stay in London. Well at least the important piece made it home! That has changed, recently. The T4 CBP area is now open for business. I went through it just last month. It's much more pleasant than the long schelpp through TBIT. That's terrific to hear! I last landed at T4 back in the summer, and we had to do the long walk, and further back was bussed from T4 to TBIT (wow is that annoying). Back when the T4 facilities closed, I'd read (on FT) that AA had to pay to staff it. I wonder what made them decide it was worth it again? In the past, after clearing immigration/customs at TBIT, I always went outside and walked to T4 to take advantage of Pre-Check. Precheck is now operating at all TBIT TSA locations. Good to know TBIT now has Pre-Check, as walking outside is unpleasant due to people smoking. remote gate arrivals are (at least sometimes) bussed to TBIT for a walk to customs and immigration at T4 (using the same walkway that used to be used to get people from T4 to TBIT baggage claim). I wonder why? Maybe has something to do with the cost? I don't think it is cost. Sometimes there are delays so the gates the flight is assigned to is not available. It is then usually up to the crew to request alternate gate or... wait. The alternate gate could be the remote pad. And the airlines also has operational consideration... if they need the airplane to turn for another flight in a few hours, they will tell the crew to wait. If not (e.g. plane will rest overnight), they let the crew ask for alternate gate. And that's how you end up at the remote LAX parking gate. Sorry if I wasn't clear. I was wondering why AA would bus from a hard stand (remote gate) to TBIT and then have people walk to T4 to clear customs and immigration, per @SeattleDavid's report that I quoted. I wasn't wondering why AA would use a hard stand/remote gate. I am going to guess that the TBIT buses are not AA operated and only go from remote gate to TBIT bus gate. Those buses are not supposed to go to T4.